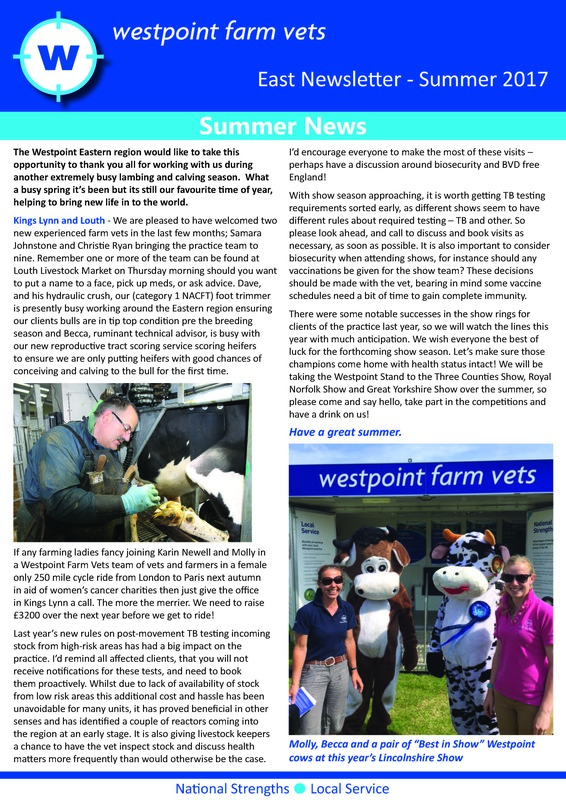 Westpoint Chelmsford is a modern, dedicated livestock veterinary practice providing a comprehensive range of health-orientated services to farms in and around the Chelmsford area. 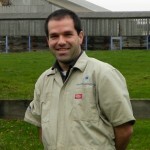 Ian graduated in 2007 from the Royal Veterinary College. He joined Westpoint straight away, completing the internship at the Horsham practice, from where he took on a major role in calf health and rearing. He also managed to see a bit of the wider world, helping out the vets in our Southwest operations during their expansion. In 2008 Ian moved up to join the team at Chelmsford and has remained there since. 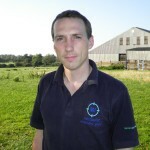 On moving to Essex, Ian has developed an interest in pig herd production, and carries out a good deal of porcine work throughout Westpoint. He is currently studying for a postgraduate certificate in Advanced Veterinary Practice. Ian also maintains a full role in the ruminant side, with particular interest in fertility, being the local bull and ram fertility testing vet. 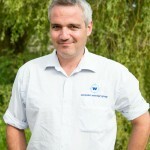 Ian became Regional Director in 2013, directly managing the veterinary teams at Chelmsford and Lavenham, and overseeing the expansion in Suffolk. His role now includes responsibility for Westpoint's entire eastern region. When not working, he is most likely to be found playing rugby or watching it, and regularly plays at half-back for Writtle rugby club. He and other half Laura - a local small-animal vet, have a boisterous Labrador named "Albie" who provides necessary distraction! Andre Baptista is originally from Portugal. He was born and raised in the countryside in a small village close to Viseu and soon developed an interest in all aspects of agriculture, and especially farm animals. Andre graduated in March 2010 from the University of Veterinary Medicine in Lisbon with a Masters in "Parasitological profile of free range chickens". Andre first realised that he wanted to specialise and develop his knowledge in farm animal medicine (mainly cattle) four years ago, when he did an externship in the USA. A year later, he returned to the US to undertake an internship for a year on a dairy farm, which turned out to be an amazing learning experience. Andre also has a particular interest in parasitology. Outside work, Andre really enjoys going to the cinema, learning new languages, travelling, cooking, reading a good book, hiking, playing tennis and all aspects of wildlife conservation. 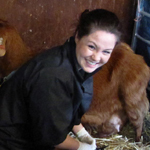 Emily has been with Westpoint Farm Vets since graduating in 2013, initially as an intern based in Winchester. 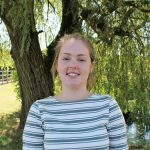 She has been in Chelmsford since 2014 and is interested in all areas of farm animal practice, with a particular interest in youngstock, herd health planning and mobility (qualified AHDB mobility mentor). She also has her export panels meaning that she can export all farm animals and products if required. When not working, Emily enjoys time spent messing around with horses and cows (preferably British Whites)! She is also a qualified athletics official and judges up to international level, as well as playing the occasional game of hockey in the winter when the rota allows! 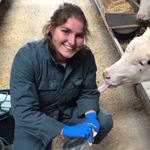 Originally from Durham, Ami graduated from Liverpool University in 2011 before undertaking a farm animal internship in production animal health and welfare at the Royal Veterinary College alongside Westpoint. 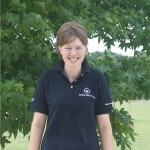 Afterwards, she moved to London to begin her PhD on investigating cattle lameness, as well as locuming for the RSPCA. She has worked with several branches of Westpoint. Now based in Witham, Ami is keen to continue post-graduate education alongside practical work, so she is working towards her certificate in advanced veterinary practice. As well as undertaking all aspects of commercial farm work, her main veterinary interests lies in production animal welfare and smallholding. She’s most at home taking care of the particular needs of hobby and open farms, and smallholdings. Outside of work, Ami reads, snowboards and competes in obstacle course races all over the world. When she isn’t training herself, she likes to spend time training her sidekick; Pets as Therapy and all-round wonder-dog, Remy. Gabriella graduated from the Royal veterinary College in July 2018 and has joined our Chelmsford practice. She is originally from rural Norfolk but has lived in Essex for a few years now, with her partner and two dogs. Gaby enjoys all aspects of farm animal work, but is particularly keen on the small ruminant side of things. Outside of work, Gaby enjoys being out and about in the countryside, usually with both my dogs (a welsh collie and a jack russell) who keep her on her toes! She also enjoys baking and cooking whenever there's time. Mariska grew up in The Netherlands and ever since she was a little girl, she knew she wanted to be a vet. Mariska studied Veterinary Medicine at the Utrecht University and followed the Master’s Degree programme ‘Large Animal Health & Veterinary Public Health’. After her graduation in October 2014 she worked at a goat farm during the lambing season and at a mixed practice for several months. She also worked at the foundation for Quality Guarantee of the Veal Sector (SKV) on a project covering the use of antibiotics to prevent resistance in the veal industry. During her studies Mariska was milking the University cows in her spare time. She spends weekends doing Veterinary Checkpoints for horses and was a volunteer at a rehabilitation centre for Wildlife Birds for many years. She also enjoys horse riding and exploring the beautiful countryside of the UK.